Take a step back in time and fall in love with this enchanting story about Coco Chanel. Based on her life, it captures her childhood, her flair for fashion with a few extra embellishments that Coco herself would appreciate. Set in France, Coco grew up in an orphanage where life was governed by rules – many of which were naturally meant as a guideline not a restriction. Coco loves new ideas, trying different ways of doing things and above all being fashionable. Coco learns how to sew in the Convent, where she creates dolls for her friends out of materials scraps all the while her imagination is running wild. Coco dreams of a time when pretty things are available to everyone and are both practical and fun. Leaving the convent life behind, Coco is inspired by hats that can be transformed into creations using ribbons, feathers and flowers. After starting a millinery store, Coco then sets about creating dresses with sleek lines without flounces or frills and not a corset in sight. Her flair for fashion then has her creating swimsuits and leads her to opening another successful store in Paris – Coco knew what women wanted to wear. But the real fashion statement happened one night when Coco was dressing to attend the opera. A gas lamp explodes destroying her pink dress and burning her hair – it’s what Coco does now that creates history and a fashion icon. 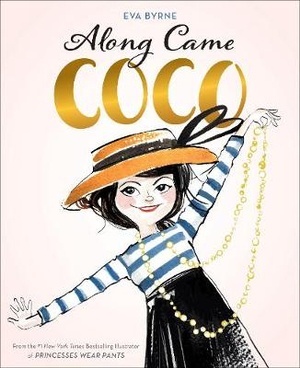 Author and illustrator Eva Byrne will take readers on a magical journey through Coco’s life both through her story and with her very chic, french looking illustrations. Readers will be so caught up in the story, you could easily forget the story is based on a real person.